This is a reminder for the Annual Cool Gales Analogue Fest which will take place coming Saturday, June 4th in Bath, UK. See my earlier post about this event for details. 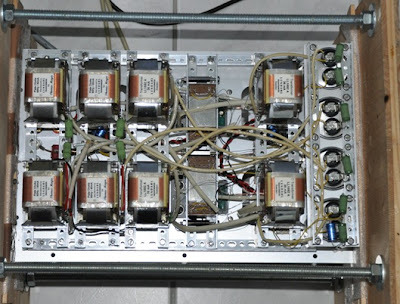 The Octal Preamplifier Mk2 (left) with external power supply (mid) and a Stereo 46 Single ended DHT amplifier (right). The Preamplifier is a full function preamp with built in MC phono stage. The phono stage uses 6SC7 and 6N7 tubes in a LC coupled circuit with passive split RIAA. 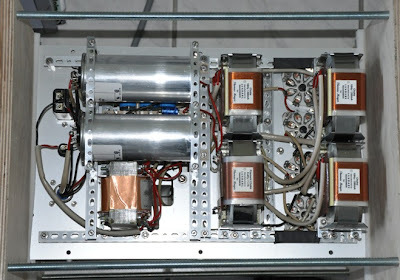 The line section uses a transformer coupled 6AH4 triode. Volume control is done with an autoformer. 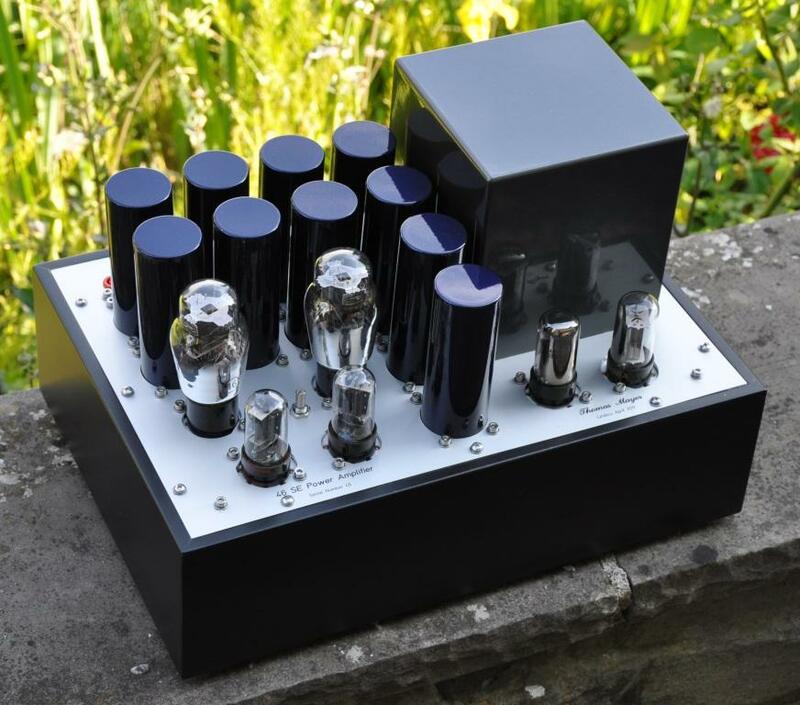 The 46 amp puts out a whopping 1.5W per channel of the finest directly heated triode sound. The 46 is similar to a 45. 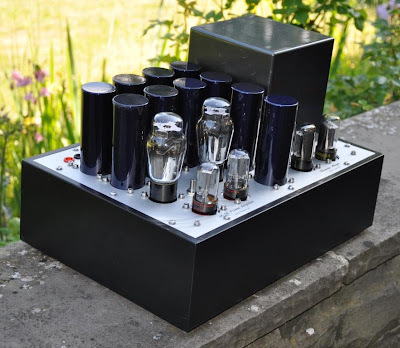 The amp will also be demonstrated with a 45 triode as output tube via a socket adaptor. Looking forward to meeting you in Bath! In the first post about my Octal Preamp I already mentioned that I have an improved circuit in mind. In the meantime the circuit has been worked out and is already tested. The main reason for a change was the gain in the line section which is a bit high in the Mk1 for the ususal line sources. So a different tube was chosen instead of the 6SN7. The Mk2 uses a 6AH4 there. The phono section is completely reworked, going to LC coupling rather than RC coupling. Quite a radical change, with lot's of iron! 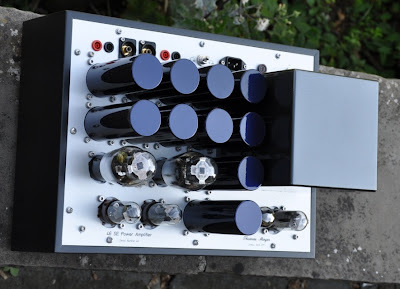 Since the line tube was changed to a less common tube, why not also change the phono input tube to something less often seen in audio? So I picked the 6SC7 instead of the 6SL7. 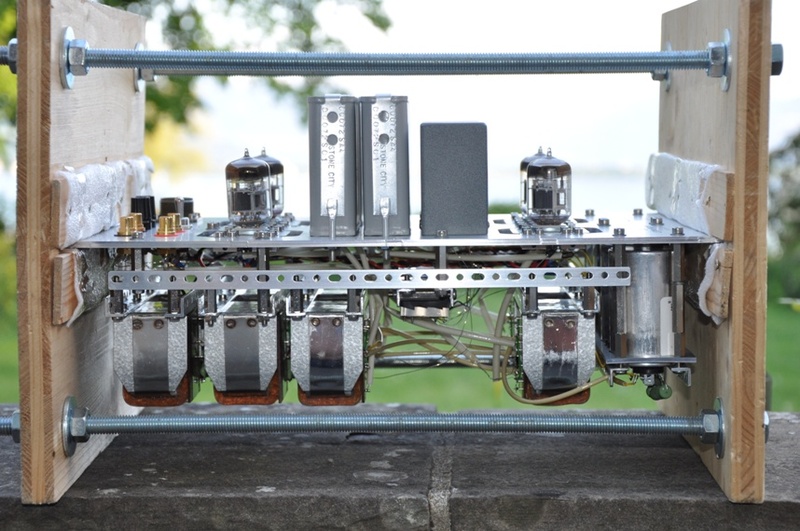 Still all octal tubes, so the name of the preamp can remain. Let's start with the phono section. Why go to LC-coupling? The 6AH4 line section would require a lower B+ compared to the 6SN7. This would offer too little headroom for the Phono section to operate with good overhead and reasonable operating points, so LC is the way to go. Lundahl has some nice plate chokes, the LL1667 which offers very high inductance. When chosen with a 5mA gap, it offers about 800 Hy of inductance. Enough for the rather high rp of the phono tubes. Even enough to skip the cathode bypass capacitors. Still the caps are drawn in in grey as an option. My first version of the preamp left them out. Works nicely. 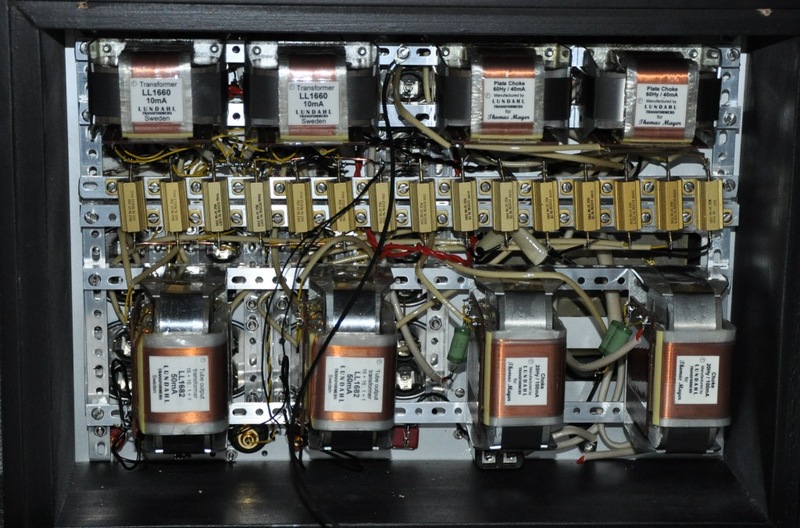 To keep the influence of the missing bypass caps low, rather lowish cathode resistors are chosen. The RIAA circuit is the same as in the MK1, split RIAA, but the component values needed some adaption. The second phono tube is still a 6N7. 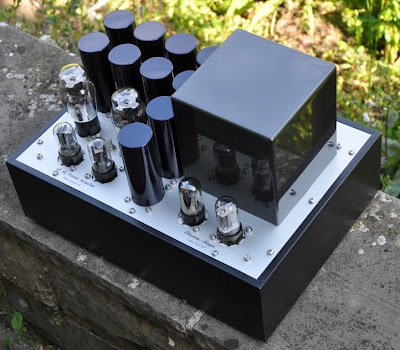 The triode section of both 6SC7 and 6N7 are paralleled. The separate chokes in the B+ lines for the two phonosection are a bit overkill. I just threw them in for the fun of it and since I had some small suitable chokes available. They can be replaced with some resistors as well, about 5k to the 6N7 and 10k to the 6SC7 will do as well. 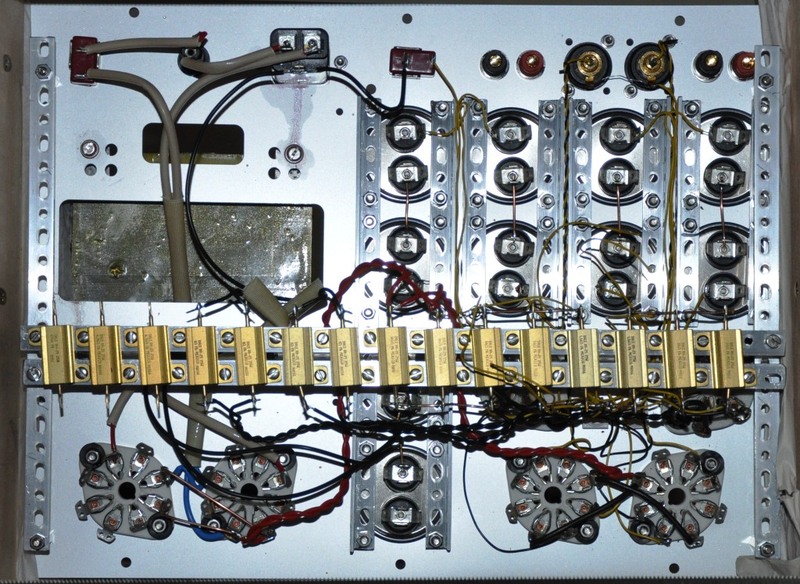 The first choke should be kept for a low ripple B+ and decoupling per channel. The preamp is playing right now and sounds very beautiful. Good resolution, musical flow, colors in tone. All is there. Not at the level as the LCR phono which I showed in an earlier post but that was expected. 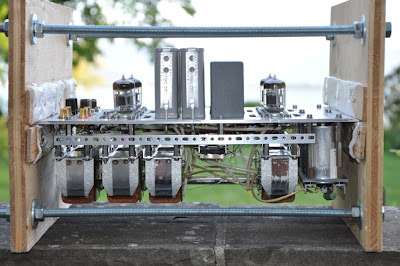 I equipped it with a built in MC step up transformer, the Lundahl LL1933 wired 1:16. The line section uses the Lundahl LL1692A which fits better to the 6AH4. Volume control is a AVC from Dave Slagle as in the Mk1 version. The preamp is quite a bit more elaborated as the Mk1, so it won't replace it but is rather a higher quality option of the Octal Preamplifier series. I will post another article with some photos of the building process in an upcoming post. Stay tuned! Room acoustics is a very popular topic, especially at audio shows. So I'd like to share my thoughts about this although many might disagree with my opinion. I think poor room acoustics are way to often used as an excuse, if a system doesn't impress the audience. Especially at public demos it is common nowadays that visitors are greeted with an excuse for the bad room. If a system doesn't play right, it is primarily the systems fault and not the rooms fault! Yes, the room has a major impact on the perceived sound. But still a system should be able to maintain it's basic character. A good system will draw you into the music and transport emotions even if the room is not optimal. The room has an influence on some of the sound aspects, but never on all. A good system will still reveal most of it's strengths in almost any room. Especially exhibitors who run public demos since many years should have gathered enough experience to set up their system in just about any location and make it sound at least decent. Have you ever attended a public demo where the exhibitor actually stated that the system is sounding the way it is meant to be? This is so far spread into the minds of the regular audio enthusiasts that they blame their room, if the system is not sounding right. Instead they should look for the systems fault. Imagine a musician does a live performance. Would you also be dissapointed about the 'sound' because the room has poor acoustics? Probably not. If he is good, you will get carried away by the music and enjoy the performance. Don't let the manufacturer of your equipment get away if you are not happy! Don't blame the room! 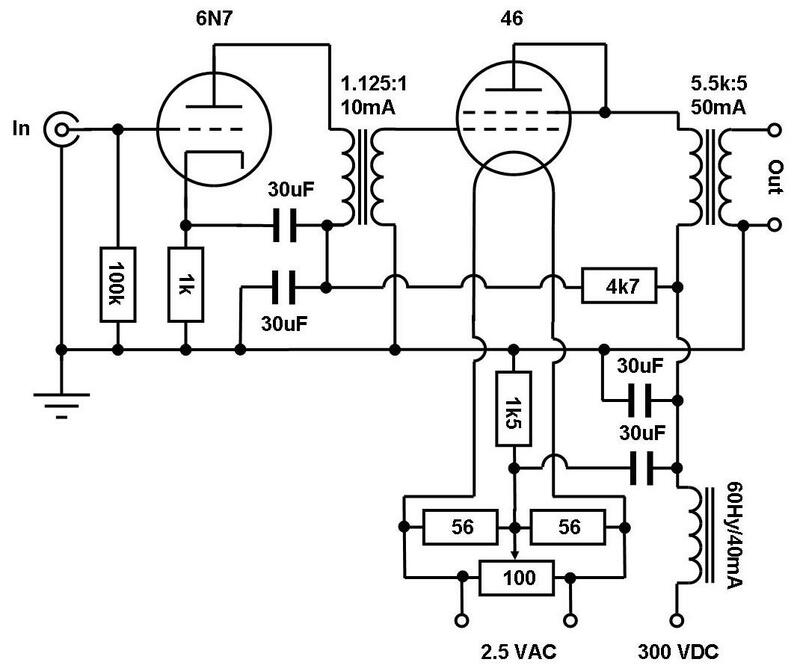 This article will show a variation of the transformer coupled single ended amplifier concept. It is based on the 46, which was presented as tube of the month in the previous post. 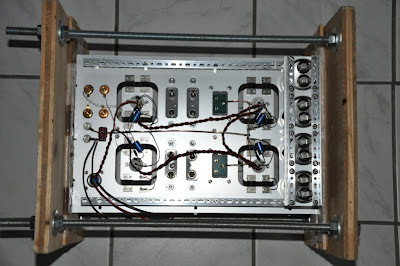 The amp was built mostly with parts which I had available. 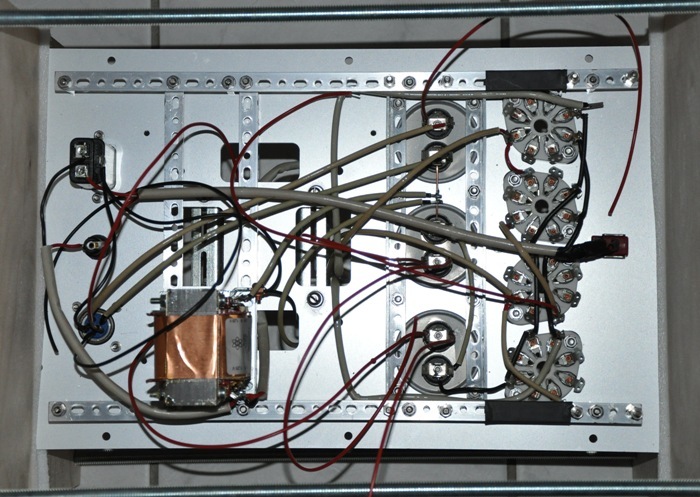 The parts cost is moderate, even using a heavy duty power transformer, ASC oil caps and all Lundahl signal transformers and chokes, the parts add up to about 1100-1200 Euros, excluding chassis. It uses all the features of this amplifier concept which contribute to the overall sound quality: Multiple choke filtered power supply, high quality caps, interstage transformer coupling, ultrapath caps in each stage. The B+ supply is the usual choke input PSU using two LC sections for smoothing. Heaters and filaments are fed with AC. 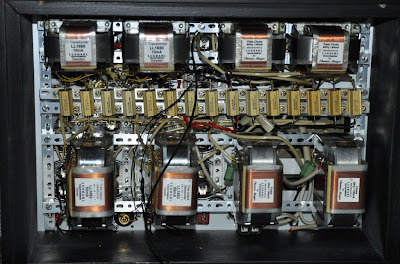 Since the heater windings have no center taps, a hum buck potentiometer is wired across the filaments of each of the 46. Two resistors are wired from the wiper to the filament terminals to reduce the resistance of the 100 Ohm Pot which I had available. 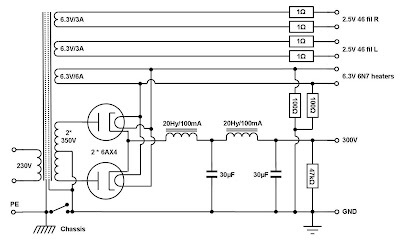 The rest of the amplifier circuit is similar as presented in previous parts of this series of posts. my favorite indirectly heated driver for small output tubes, the 6N7 is used again, both halves wired in parallel. The output tube is driven by a Lundahl LL1660/10mA, wired almost 1:1 (actually it is 1.125:1). I had a pair of Lundahl LL1682/50mA in stock. These fit quite well to the 46. With the primary impedance of 5.5kOhm and a secondary of 5 Ohm they will provide a good damping factor when used with a 46 on 8 Ohm speakers. The 46 is wired for Class A use, with the second grid tied to the plate at the socket. 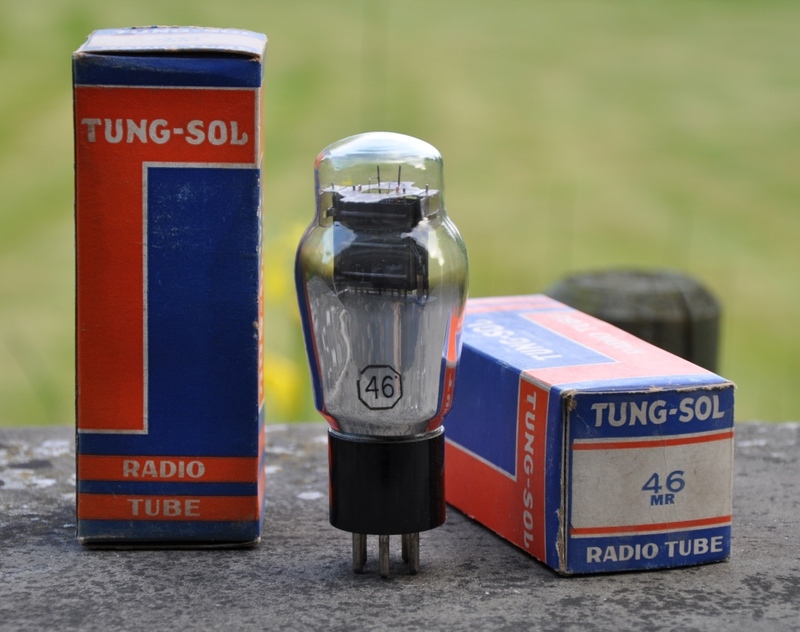 See the 46 datasheet for details of the tube. The B+ is around 300V. The 46 is biased at around 30V. 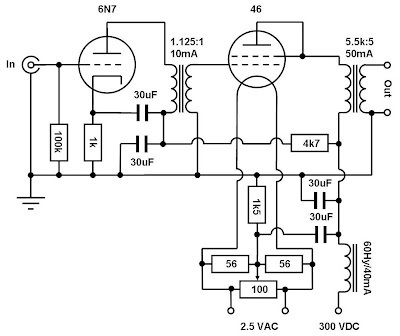 With voltage drops across chokes and output transformer primaries this results in just under 250V across the 46. 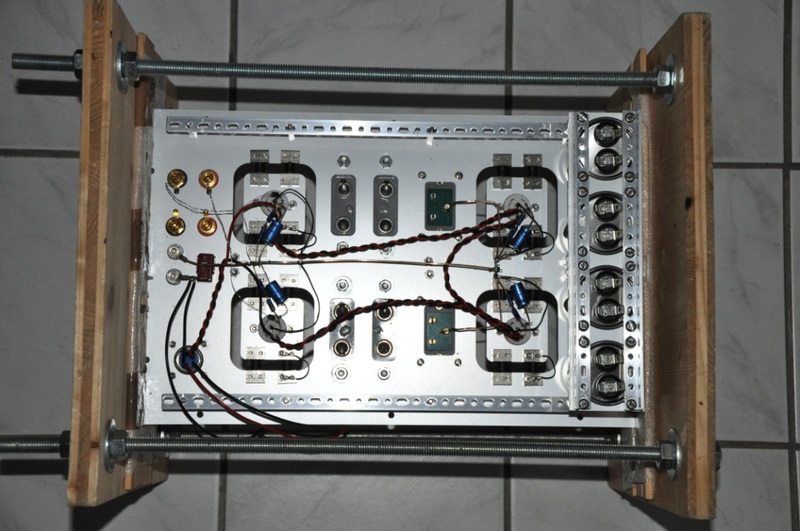 Below, some photos of the construction of the amplifier. 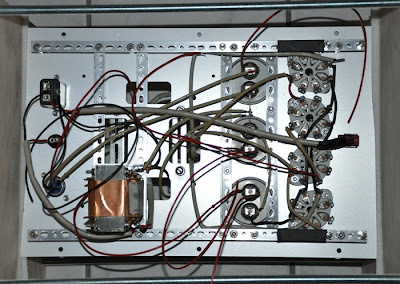 The first picture shows all capacitors, sockets, connectors, switches and resistors mounted and some initial wiring. 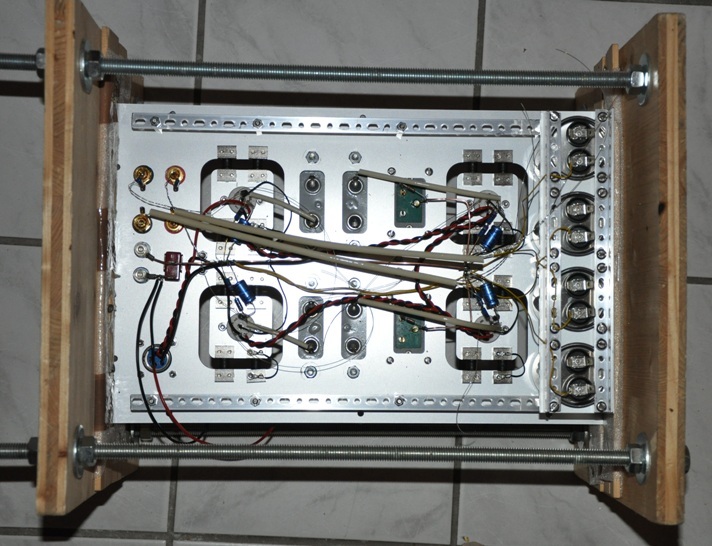 The power transformer is placed on the top side of the plate and will be hidden under a cover. The amp sounds very smooth and delicate. 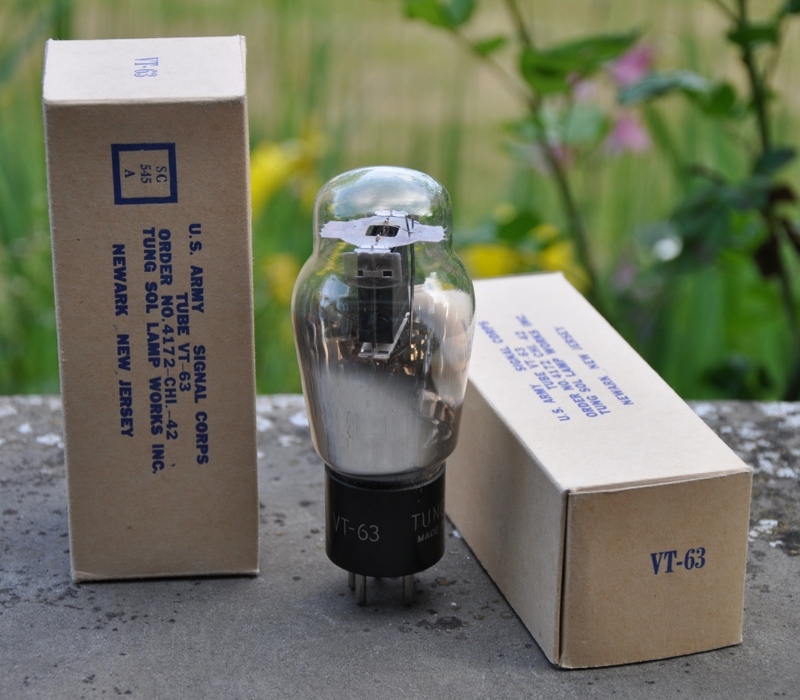 It shares a lot of qualities with the best 45 amps at a lower cost and size. 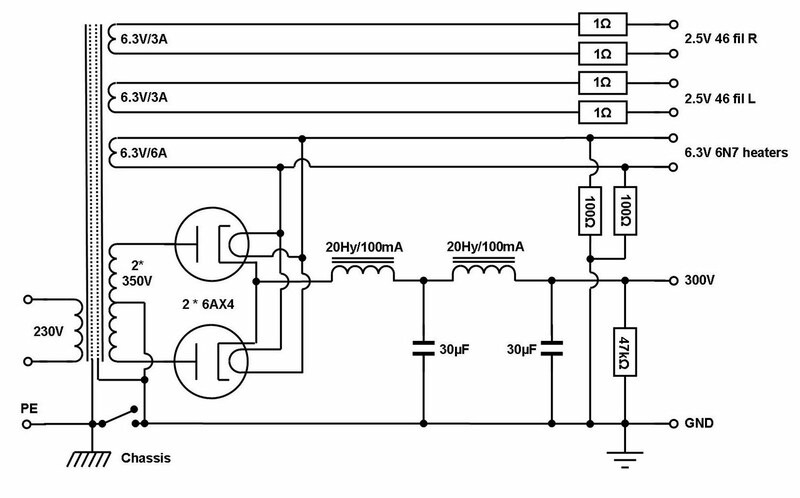 The same circuit can be used with minor adaptions for 45 or 2A3 output tubes. 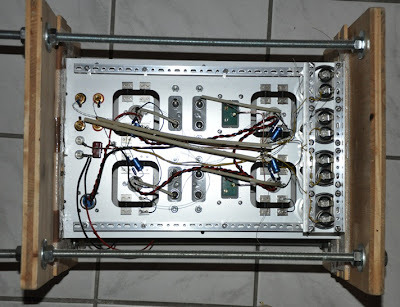 In this article I will show the process of the internal build up and wiring. Ready for the first test run! Measurements look good and the initial sound is as expected compared to an exisiting EC8020 phonostage. Some extended burn in still to be done and fine tuning. Then the plates will be mounted in wooden frames. This is a topic which is debated a lot on the internet. Also a question I'm beeing asked often. 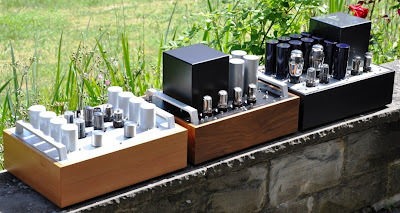 Many people are wondering why I write so little about the sound of the amps and preamps which I'm showing on my blog. The reason for that is simple: Perception of what is good sounding is so different among people. Preferences vary a lot. Over the years I attended many listening sessions with others. It is amazing how different the perception of sound can be. Some people get excited by a difference between two components while others can hardly distinguish them. Also what value is in there if I write about the sound of my own equipment? This description would be very subjective and biased and I would find little use in it for others. Yet I understand it is difficult for someone to get an impression how things might sound if they don't have a chance to listen them themselves. So I decided to give some information about what I'm looking for in sound. The series about favorite records will also help to get a feeling which kind of music I prefer. I'm after a high resolution and detailed sound. It should be neutral and transparent. Yet the details should not distract from the whole music representation. All must be integrated and harmonious. While many people believe high resolution and an emotionally involving sound exclude each other, I strive to get both. In voices I want excellent articulation, especially in the s-sounds. 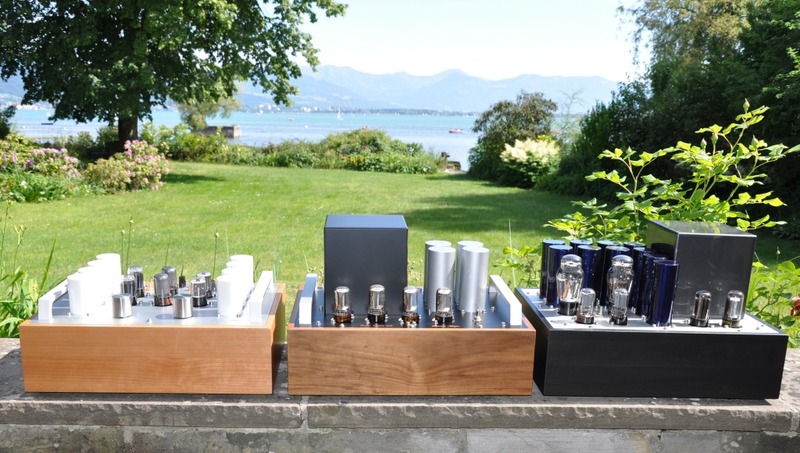 Many amps and especially phono preamps tend to fail there. They can hardly distinguish between s, sh, ch, sch, z and ts like sounds. All is merged into a tsingy kind of noise. Good preamps can resolve these slightly different sounds clearly. Especially LCR phonostages excel in this regard. I'm not much into sound stage any more. I used to be years ago, but lost interest in that. Often I don't even bother to sit in the sweet spot. But people who use amps I built, tell me they love the sound stage they produce. I want my equipment to sound as detailed as possible, yet smooth. I want all the colors in tone, the tiny vibrations in amplitude and frequency a vibraphone creates. The attack of piano notes when the keys are hit hard, the soft flow of the pianos notes when played gently. Both the wood and the steel sound of the piano. I don't want the bass sounds to be black and dry. There is no black in sound but thousands of nuances from brown to grey to dark. Dry is boring. I want a sound which is wet. Another point I listen for is ambience. This is the silence between the notes. A good amp lets you feel the ambience even between the sounds, the presence of people, of the room. Summarizing, what is important is that the equipment can draw you into the music and let you forget about the system. Then it does the job right. For me this works if the properties mentioned above are fullfilled. When I have a new amp or preamp finished, I hook it up to the system and let it play. I then make myself a coffee and light a cigar. I sit on the terrace with the door to the living room open. If the amp is good, it will sound convincing even from that listening spot. This is a quite good test all amps have to pass. I'm more after the big differences. Those which can be heard from the next room. There is a tendency in the audio scene and especially in the glossy magazines to concentrate more and more on silly details which create miniscule differences in sound. Like wire, power cords, equipment stands and lately even fuses. Don't get me wrong, my experience is that almost anything in audio makes a difference in sound. But as long as I can achieve larger scale sound differences I find it boring to play with such details. My focus is on circuit topologies, different tube classes, etc. Many people believe that especially amps have advanced to a level that there is little difference in sound, so all you can do is play with different wire, power cords and stands. Especially glossy hifi magazines fuel this belief. I don't think so. I think there is still a long way to go. I also think that if any amp reacts sonically to such things, it is rather a sign of poor engineering than of it's quality. A well designed component should not react much to changes in it's periphery. 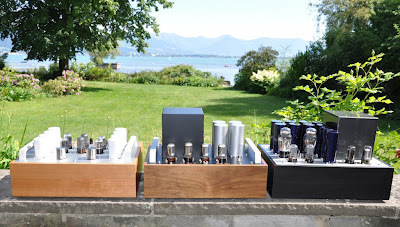 I only present amps, preamps or circuits here on my blog, of which I like the sound. The more elaborate designs have more of everything, the simpler and less costly designs still have the same basic characteristic but with some compromises, typically in resolution. So the description of my preferences might be helpful. Yet I encourage everybody to listen for himself, only then you can say if you'll like it ot not. Don't rely on other people's judgement. I've seen very different judgements by different people. What one person regards as high resolution and neutral sound can be annoying to someone else. I also once listend to a preamp with someone which supposedly has good 'pace rythm and timing' to me it just sounded nervous. Also be aware that human listening is an extremely complicated system which is amazingly high resolution but can also fool you. Sometimes people just want to hear a difference, then you can be sure it is heard. Also vice versa. If you don't want to hear a difference you won't. One thing I learned through the many years I'm into audio: Don't take anything for granted. If you can't hear a difference, it does not mean that there really is none. Also the opposite holds true: If you do hear a difference it doesn't mean that there really is one.